SAGITA COM - Aimersoft Video Converter Ultimate v5.5 adalah program penuh fitur menggabungkan Video Converter, DVD Ripper, Video Editor, DRM Remover, Transfer Video, Video Online Downloader, dan DVD Creator menjadi satu, menawarkan solusi yang komprehensif untuk memenuhi kebutuhan multimedia Anda. Apakah Anda ingin mengkonversi Video / DVD ke format yang Anda butuhkan, membuat video yang unik, menonton film DVD pada perangkat seperti iPod, iPad, iPhone 3GS \ iPhone 4 (4G), membakar video ke DVD ! 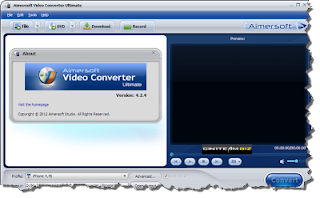 Aimersoft Video Converter Ultimate v5.5 Full adalah jawabannya. Convert video standard and high definition videos. removed DRM protection from WMV WMA, iTunes M4P M4A M4V AAC M4B ASF. Rip DVD to popular video / audio files. Download video online (YouTube, Yahoo Video, Google Video, etc.). Directly transfer songs & video players and mobile devices like iPod, iPhone, iPad, PSP, etc. Extract audio from video as MP3, WMA, OGG, WAV, M4A, etc. Edit videos by splitting, cutting, connections, etc. Burn files to DVD disc, DVD folder or ISO files. Merge multiple files into one. Hmmmm keren.. bisa request, Samsung Kies For Win XP yang offline instaler ga Sob? Mantap Gan .. Izin Sedot dulu ! Jangan Lupa Mampir ke blog ane . . .